Modern content marketing is a bit different than it was a few years ago. No longer does your blogging team get to generate a blog subscriber and drop them off at the nearest sales bus station, waving as they drive away and washing their hands of the lead. Instead, you need to, jointly with your sales team, craft a marketing and sales funnel which incorporates content and education into every stage, and beyond into user onboarding and creating customer loyalty. "Content marketing is now more about framing the path for your prospective customers than putting them on it." This concept, of a holistic strategy that incorporates content directly into the marketing and sales funnel, needs some explaining. To get my newest ebook, which takes a more comprehensive look at this subject, check out "The Modern Marketer's Guide to Holistic Content Marketing"
There are a thousand articles and guides for increasing your blog’s traffic. From SEO and advertising to skyscraper tactics, influencer outreach and social media, the topic is saturated. And it’s odd, especially because driving more traffic to your blog and website is often a wasted endeavor. After all, it doesn’t matter if you’re getting one reader a month or one million, if none of them are becoming customers you’re in the same position either way. The chief issue I see with content marketing isn’t standing out from the crowd or driving traffic, but in monetizing the traffic you already have. Luckily, the number and strength of your business’ lead generation strategy is restricted only by your own creativity. Ebook banners are probably (along with the scrolling form) the most common strategy for generating subscribers from blog content. Clicking on this banner sends readers to a landing page which “email-gates” access to the ebook. Once a visitor converts on the page they’re added to a segmented lead list. If they opt-in for blog subscription as well, all the better. Ebooks are a rougher form of content upgrades (see below). They're related to the subject-at-hand (the blog article) and give a more comprehensive look at something you know the reader is interested in. Ebooks (once you start repurposing existing blog content) are relatively simple to create and, as evergreen content, can continue to generate leads for your business for months or years. Ebooks can be crafted from your existing blog content (so long as that content is related to the same subject). The most cost-effective strategy is to intentionally write 4-7 blog articles on the same subject and then re-format the content into a PDF. Scroll forms are the most common lead-gen techniques you'll see. And they wouldn't be so ubiquitous if they didn't work. The scroll form appears in the right margin of the screen, so it doesn't impede a blog visitor's ability to read. This makes scroll forms far less aggressive than, for instance, an entry or exit popup. Because scroll forms, like scroll popups, appear only after a visitor has scrolled a certain percent of the page, you can be confident that whoever sees it has already gotten value out of your blog. Delivering value before asking for a conversion is not just best practice, but a fundamental rule of marketing. The standard strategy for implementing content upgrades is through a click popup attached to call-to-action text, highlighted within your articles. Each content upgrade is created for the individual article it’s embedded in. This means you’re investing more time and resources into each piece, but it’s well worth it. Notice that the CTA copy showcases the specificity of the upgrade: "Download a free 5-step checklist to optimize your sales funnel using conversion psychology" (the subject of the article) as well as "2 bonus factors not included." They’re Hyper-Relevant: They're related to the exact content at hand. Rather than being a general look at a subject (ebook), they're directly related to the article your visitor is reading. For more on content upgrades, check out my article "How we Used Content Upgrades to Increase Email Opt-ins 16X". Alternatively, check out "7 Content Upgrade Ideas and Examples that Helped Build 100k Subscriber Lists"
Collecting leads is just the first step of the journey toward a final conversion. You need to provide those leads with high quality content relevant to the specific stage they’re at. This is called lead nurturing. Think about it like this: If driving traffic to your blog is pointless unless you have a strategy to convert traffic to leads, generating leads is equally pointless unless you have a strategy to convert them to sales. The goal? Prove to your leads that you understand their problems, know the solution to their problems, and that your business' service, software or product addresses their problems. Lead nurturing is about creating and sharing awesome, relevant and valuable content and delivering that content to the right people to encourage a paid conversion. Unfortunately, not all your prospects are the same: the reason why, and how, people purchase your products varies widely. This means that a “one-size fits all” approach simply won’t work, and as a marketer you need to understand and identify the differences within segments of your target market in order to create content and offers tailored to each. The chief strategy for this is to create content desirable to each segment. For instance, if your business creates social media management software, create content targeted at A) The personal social media user looking to drive name recognition, B) The small business struggling for time and resources and C) The large organization focused on data-driven results. Doing this allows you to segment your leads into those three target markets and deliver relevant content accordingly within a nurturing stream. But segmentation isn't just about sector or demographics. It's perhaps most importantly about where a lead is within your marketing funnel. You can’t look at your prospects statically, as if they simply pass from stage 1 (early-stage lead) to stage 2 (late-stage lead) and then to stage 3 (customer) the same way each time. Many customers start at stage 2 (ready to buy), but decide they need more time to research. Many remain in stage 1 for weeks or months before jumping directly to stage 3 with no warning. This means your lead nurturing campaigns must be forgiving and dynamic. Allow leads to say no to your sales emails, but ensure this action doesn’t result in them being dropped from your nurturing campaign. Put time into a “catch-all” nurturing stream (many businesses use their newsletter mailouts) for Stage 1 leads as well as leads with whom you need to stay top-of-mind. For more on lead nurturing and closing with content, check out my article on Creating a Lead Nurturing Email Drip. If you're in the B2B sector, check out this more specific article on Lead Nurturing for B2B. There's no real preamble necessary here. 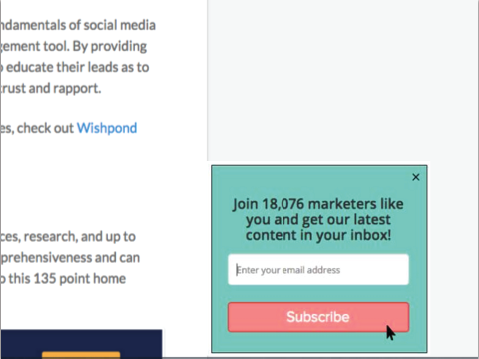 It's just a strategy I want to share with you, as it's simple to implement and giving us huge returns: On the Wishpond blog, click popups have shown to convert traffic 85% better than campaign-specific squeeze pages. Click popups allow blog readers to stay within an article, engaging and converting without having a new tab opened or even, really, moving their mouse that much. Click popups have a lower barrier-to-entry (generally) than landing pages - an email address and, maybe, a first name. Click popups don't give readers time to think. They think "sure, I'll check out a content upgrade for this article," and then the form appears on their screen, reiterating the value of the content, and they're done. Hopefully this article has given you a better idea of how to think about content marketing in the new year. It's not just blogging; not just infographics, social media and influencer outreach. Content is a crucial part of your entire marketing and sales funnel. Thinking about it only in terms of how it drives search traffic from Google and provides ammunition for your Facebook Page is small-time. I want you to hit the big leagues. If you have any questions or are confused by anything ing I mentioned, don't hesitate to reach out in the comment section.